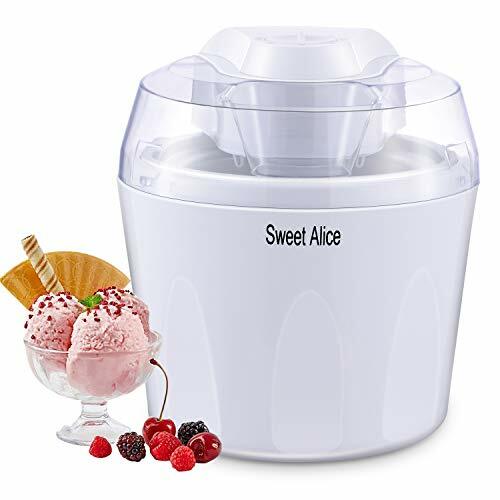 DIY delicious and healthy ice cream at home with Sweet Alice ice cream maker! ❄Prepare the inner bowl in the freezer for 8-12 hours. ❄Choose recipes you like and prepare ingredients. ❄Put the inner bowl in the base, mix your ingredients together and pour into the inner bowl. ❄Turn on the machine and set the timer, the paddle will do all the work. ❄You can still add ingredients while stirring. Makes 1.5L ice cream, frozen yogurt, gelato or sorbet in no time. 30 mins countdown timer with auto shut off function. Large ingredient spout for easily adding favorite mix-ins. BPA-free material assure the safety of you and your family. Detachable bowl and mixing paddle are easy clean.